The Redemptorists » Happy Feast of St. Clement Hofbauer! 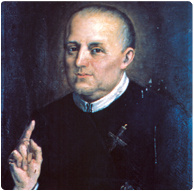 St. Clement Mary Hofbauer isn’t well known in the United States, but the Redemptorists may not have come to this country when they did if it hadn’t been for him. As we celebrate in 2012 the 180th anniversary of the arrival of the Redemptorists in the New World, we offer special thanks to God for the life and legacy of St. Clement, who died on this day in 1820. St. Clement is considered the second founder of the Redemptorists because he led the mission to establish houses in Poland and Vienna, the first foundations outside of Italy. St. Clement began exploring the idea of bringing the Redemptorists to North America as early as 1806. European politics were making it increasingly difficult to train, educate, and provide for new Redemptorist missionaries. From his base in Vienna, St. Clement wrote to several friends, sharing his hopes of finding a suitable place in America or Canada where he could send the students. Twelve years after his death, Venerable Joseph Passerat, whom St. Clement handpicked to succeed him as superior of the Redemptorists north of the Alps, made Clement’s dream a reality. It was Passerat who sent six Redemptorists — three priests and three brothers — to America to work among the Native Americans and the German immigrants in what is today western Ohio, Wisconsin and Michigan.